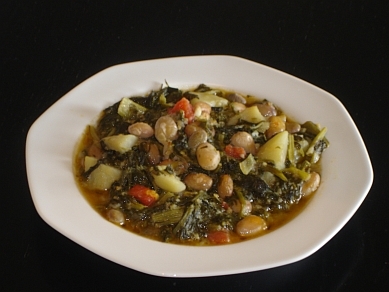 This is a simple and nutritious stew-type recipe. It's what you could call a 'village' dish and is really tasty as well as healthy. Chard (called Seskoula in Greek) is a popular green in Greece and the Mediterranean as a whole. It should be available where you live - it is sometimes also called Silverbeet or Swiss Chard. The beans you use should ideally be fresh - if they are dried, then you'll need to leave them to soak overnight before you cook them and simmer them for longer before you add the chard. Rinse the chard well and blanche it in boiling water for 2 minutes. Drain well and when it has cooled chop roughly into approx. 5cm pieces and set aside. Put the oil into a large shallow pan and sauté the onion for 3 minutes. Add the beans and chilli pepper(s) and sauté for another 2 minutes. Add 300ml water and the tomato and bring to the boil. Cover the pan and simmer for 30 minutes. Add the chard, potatoes, parsley, salt and pepper and simmer for another 15 minutes with the pan uncovered until there is no water remaining.